6.2. Does Planner find the optimal solution? 6.5. Which optimization algorithms should I use? 4 queens has 256 possible solutions (4 ^ 4) and 2 optimal solutions. 5 queens has 3125 possible solutions (5 ^ 5) and 1 optimal solution. 8 queens has 16777216 possible solutions (8 ^ 8) and 92 optimal solutions. 64 queens has more than 10^115 possible solutions (64 ^ 64). Most real-life planning problems have an incredible number of possible solutions and only 1 or a few optimal solutions. For comparison: the minimal number of atoms in the known universe (10^80). As a planning problem gets bigger, the search space tends to blow up really fast. Adding only 1 extra planning entity or planning value can heavily multiply the running time of some algorithms. An algorithm that checks every possible solution (even with pruning) can easily run for billions of years on a single real-life planning problem. What we really want is to find the best solution in the limited time at our disposal. Planning competitions (such as the International Timetabling Competition) show that local search variations (tabu search, simulated annealing, ...) usually perform best for real-world problems given real-world time limitations. Scale out: Large production datasets must not crash and have good results too. Optimize the right problem: The constraints must match the actual business needs. Available time: The solution must be found in time, before it becomes useless to execute. Reliability: Every dataset must have at least a decent result (better than a human planner). Given these requirements, and despite the promises of some salesmen, it's usually impossible for anyone or anything to find the optimal solution. Therefore, Planner focuses on finding the best solution in available time. In realistic, independent competitions, Planner often comes out as the best reusable software. The nature of NP-complete problems make scaling a prime concern. The result quality of a small dataset guarantees nothing about the result quality of a large dataset. Scaling problems cannot be mitigated by hardware purchases. Start testing with a production sized dataset as soon as possible. Don't asses quality on small datasets (unless production encounters such datasets). Instead, solve a production sized dataset and compare with the results of longer execution, different algorithms and - if available - the human planner. 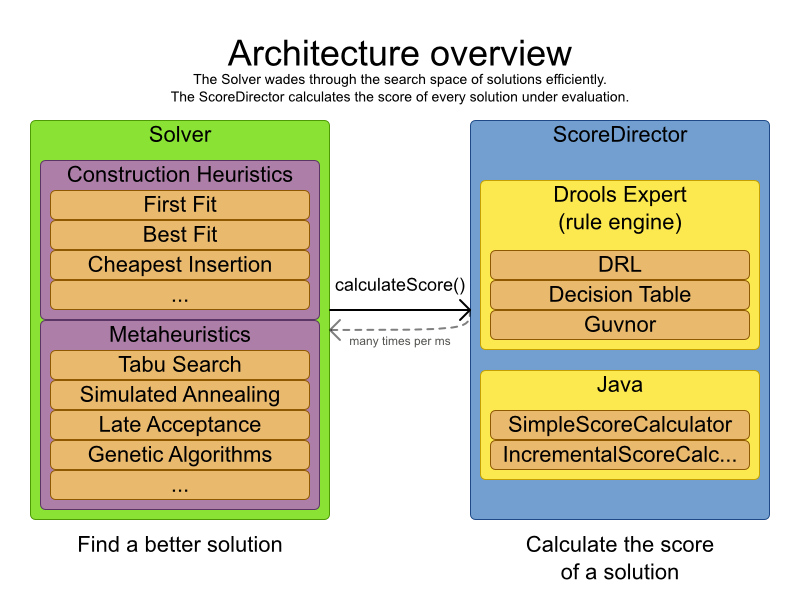 A rule engine such as Drools Expert is great for calculating the score of a solution of a planning problem. It makes it easy and scalable to add additional soft or hard constraints such as "a teacher shouldn't teach more then 7 hours a day". It does delta based score calculation without any extra code. However it tends to be not suitable to actually find new solutions. An optimization algorithm is great at finding new improving solutions for a planning problem, without necessarily brute-forcing every possibility. However it needs to know the score of a solution and offers no support in calculating that score efficiently. If you want to learn more about metaheuristics, read the free book Essentials of Metaheuristics or Clever Algorithms. The best optimization algorithms configuration for your use case depends heavily on your use case. Nevertheless, this vanilla recipe will get you into the game with a pretty good configuration, probably much better than what you're used to. At this point the free lunch is over. The return on invested time lowers. The result is probably already more than good enough. If you have time, continue experimenting even further. Blog about your experiments! A Solver can use multiple optimization algorithms in sequence. Each optimization algorithm is represented by a SolverPhase. There is never more than 1 SolverPhase solving at the same time. Some SolverPhase implementations can combine techniques from multiple optimization algorithms, but they are still just 1 SolverPhase. For example: a local search SolverPhase can do simulated annealing with planning entity tabu. If the Solver terminates (before the last phase terminates itself), the current phase is terminated and all subsequent phases won't run. 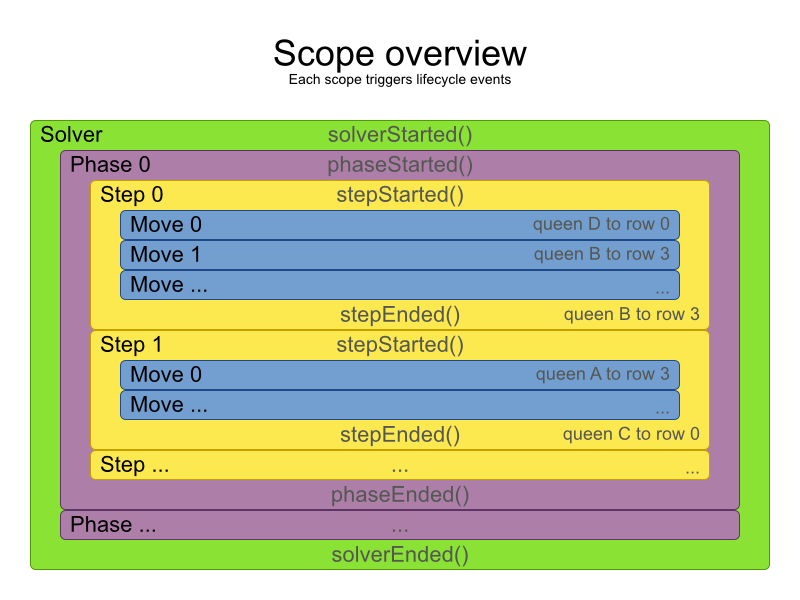 A solver will iteratively run phases. Each phase will usually iteratively run steps. Each step, in turn, usually iteratively runs moves. These form 4 nested scopes: solver, phase, step and move. Configure logging to display the log messages of each scope. Not all phases terminate automatically and sometimes you don't want to wait that long anyway. A Solver can be terminated synchronously by up-front configuration or asynchronously from another thread. 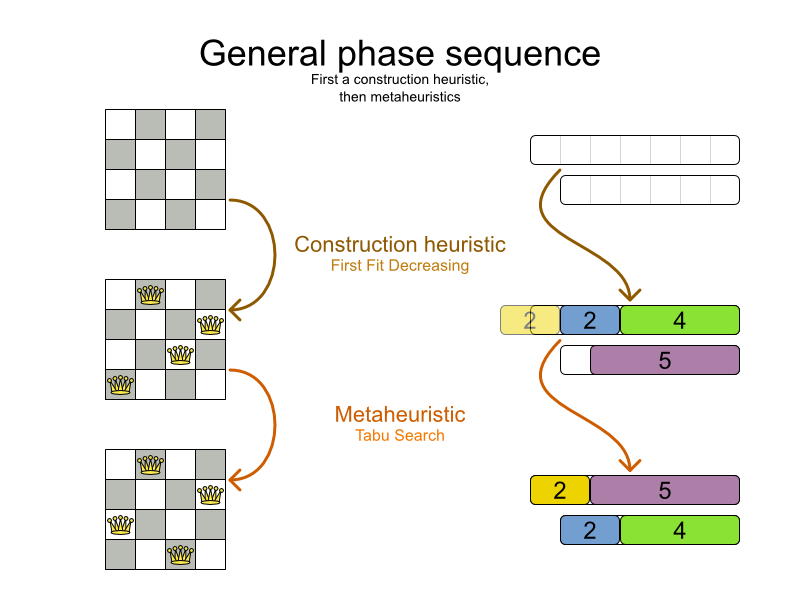 Especially metaheuristic phases will need to be told when to stop solving. This can be because of a number of reasons: the time is up, the perfect score has been reached, ... The only thing you can't depend on, is on finding the optimal solution (unless you know the optimal score), because a metaheuristic algorithm generally doesn't know it when it finds the optimal solution. For real-life problems this doesn't turn out to be much of a problem, because finding the optimal solution could take billions of years, so you 'll want to terminate sooner anyway. The only thing that matters is finding the best solution in the available time. For synchronous termination, configure a Termination on a Solver or a SolverPhase when it needs to stop. You can implement your own Termination, but the build-in implementations should suffice for most needs. Every Termination can calculate a time gradient (needed for some optimization algorithms), which is a ratio between the time already spend solving and the estimated entire solving time of the Solver or SolverPhase. The available CPU time influences the number of steps that can be taken, which might be a few more or less. The Termination might produce slightly different time gradient values, which will send time gradient based algorithms (such as simulated annealing) on a radically different path. You can use this Termination to terminate once it reaches a feasible solution. This Termination can only be used for a SolverPhase, not for the Solver itself. If the score hasn't improved recently, it's probably not going to improve soon anyway and it's not worth the effort to continue. We have observed that once a new best solution is found (even after a long time of no improvement on the best solution), the next few steps tend to improve the best solution too. This example ensures it doesn't just terminate after finding a feasible solution, but also completes any obvious improvements on that solution before terminating. If you call the terminateEarly() method from another thread, the Solver will terminate at its earliest convenience and the solve() method will return in the original Solver thread. Each time a new best solution is found, the Solver fires a BestSolutionChangedEvent. Between phases or before the first phase, you might want to execute a custom action on the Solution to get a better score. Yet you'll still want to reuse the score calculation. For example, to implement a custom construction heuristic without implementing an entire SolverPhase. Most of the time, a custom construction heuristic is not worth the hassle. The supported constructions heuristics are configurable (so you can tweak them with the Benchmarker), Termination aware and support partially initialized solutions too. Any change on the planning entities in a CustomSolverPhaseCommand must be notified to the ScoreDirector. Do not change any of the planning facts in a CustomSolverPhaseCommand. That will corrupt the Solver because any previous score or solution was for a different problem. If you want to do that, see repeated planning and real-time planning instead. It's possible to configure multiple customSolverPhaseCommandClass instances, which will be run in sequence. If the Solver or SolverPhase wants to terminate while a CustomSolverPhaseCommand is still running, it will wait to terminate until the CustomSolverPhaseCommand is done, however long that takes.